It’s always big news when a new business appears in a small town but after 875 days of waiting for eMbers Venue in Rensselaer, Indiana to open, it’s probably bigger news than most. In fact, I think it’s safe to say that it’s made that entire block in this town receive a definite boost in curb appeal. Once the old hardware store and later the location of a magazine warehouse and distributor, many Rensselaer residents can recall the days when the space held nails, hammers, and shovels. Today, it is a far cry from those humble origins. Located on the corner of Washington Street in this small Indiana town, eMbers Venue possesses a unique mix of modern and traditional elements. Somehow–it all works very, very well. Every space in this amazing venue fairly gleams. A warm re-purposed wood floor, gleaming bar, lengthy exposed brick wall, and modern light fixtures give eMbers a feel all its own. It’s stylish and artsy and oh so creative. Don’t let the term “venue” throw you off. It’s really just a fancy name for event hall. It’s a place meant for dancing, for dining, and for special occasions of all kinds. 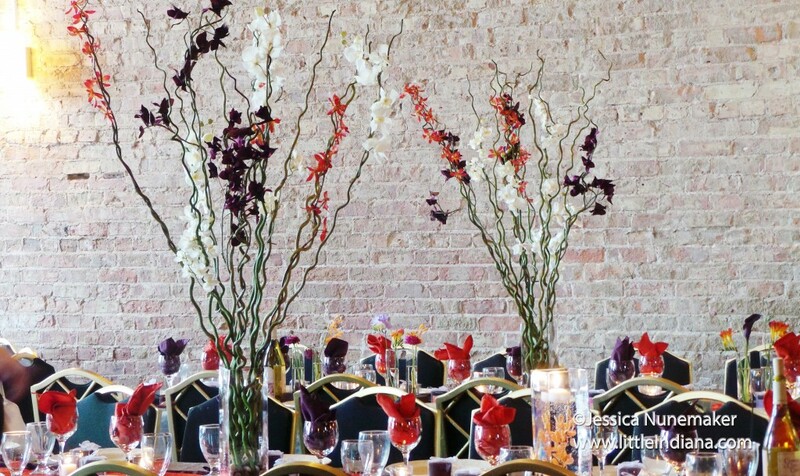 High school graduation parties, wedding receptions, corporate functions, birthday parties–anything that needs a space of its own can find it at eMbers in Rensselaer. 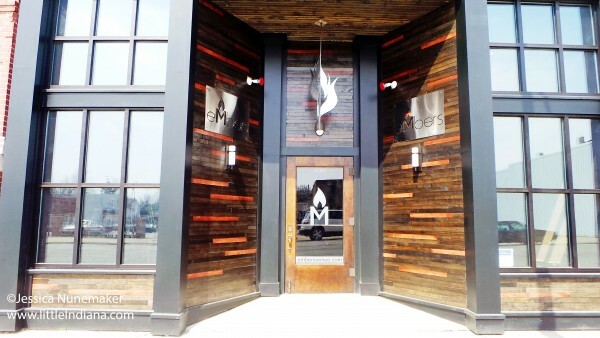 I had the chance to check out eMbers after it was decorated for a wedding reception. I think it gives you a great idea of what it can look like. Now, imagine a color-changing bar, the lights on the wall all lit up, and tables decorated by your own event planner or family members just waiting for you and yours. eMbers Venue is more than a pretty face. It is made for events and special occasions! With a three-way liquor license, it can hold its own. But eMbers has something else in its favor: character. Running the length of eMbers Venue is an amazing wood floor. It’s not original to the building but is instead a very creative way to make good use of flooring that was once a part of the old elementary school gymnasium in Rensselaer before its demolition in early 2013. The owners shared that at their first event here (the above-mentioned wedding reception) that different people would come up to the bar or point at the floor and comment that this spot is where they made a 3-point shot and other PE-related comments. You have to love that small town humor. 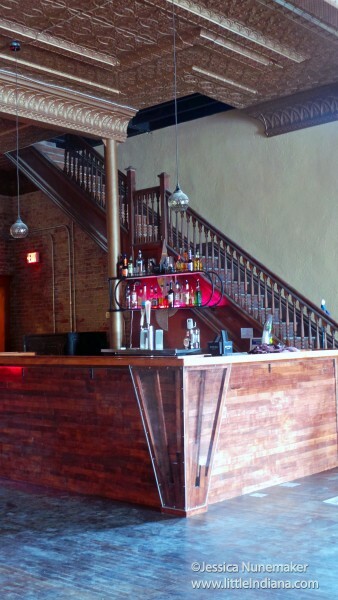 Yes, even the bar makes good use of that flooring. It’s really incredible. With distressed metal paired with the wood and unique lighting, it’s functional, practical, and gorgeous. Pretty much like everything else here inside (and out) at this Jasper County event hall. eMbers Venue looks like something out of a magazine. It’s sleek and shiny and looks very high-end. But (and here’s where you can breathe easy) it still has the small town Hoosier hospitality and reasonable pricing you expect. Did I not mention they are also using Bub’s Barbecue as their caterer? Can you stand all the awesome? It’s another reminder that old buildings are always worth saving. I can provide more than a few examples of places that seemed destined for a tear-down–and instead have become the real hubs of their community. It’s hard work, of course, but just like the fine folks at eMbers show, when you have a fire and a passion for what you do–you can’t let anything stop you–not even a building packed with lots of stuff, like 7,000 pounds of metal and 2,500 pounds of papers and magazines for recycling that has to be cleared out before you can even begin the restoration process. eMbers has really got something special here. After stepping inside so many small businesses by this point, I can tell when a place is going to really take off. This one is going to be BIG. To see the latest community events, please follow eMbers on Facebook.